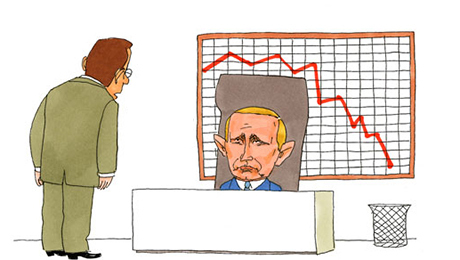 While Eastern Europe nervously awaits Putin's next move, cartoonist Pancho offers some perspective on Russia's recent actions against Ukraine. Cartoonist Pancho is known for his comic strips and caricatures featured in Le Monde Diplomatique, Lire, Le Magazine Literaire and the International Herald Tribune among other publications. Born Francisco Graells in Venezuela, he was first published at age 24 in a Uruguay weekly called Marcha, where he was a contributor until the military coup in 1973 that shuttered the publication. Pancho later moved on to publish his work in various magazines and journals in Buenos Aires and in the 1980s became artistic director of Numero, which reaches Colombia, France, Mexico, Brazil, Switzerland and the U.S. Pancho has lived and worked in France since 1983.